Believe it or not, it’s been a month since I last posted about my commission. I feel like the past four weeks have been very productive and that is visible in the photograph, below. Here’s last month’s picture, for dramatic effect. On Saturday I finished the first page of the pattern – one down, 36 more to go, and I’m feeling surprisingly optimistic. I recently treated myself to a second DMC bin just for the threads from this project. It’s made a huge difference in the amount of time I spend looking for the next colour, because they’re now organized numerically instead of by shade. My mind is still being blown that it’s almost June. I swear NYE was like, last week? My latest theory is that it’s because I spend so much time on the internet that this year is flying by. What do you think? How are your big projects going? How are you feeling about it? I know things have been a little bit more quiet around here than usual. There’s one huge reason why. Almost two months ago now, someone very close to me requested that I make an embroidery for someone very close to them. They wanted something “earthy.” We went back and forth for a few days, and decided on a pattern from Etsy. I ordered the pattern, and placed an online order for the canvas and all of the different coloured threads, and wasn’t too worried about it. Then the goods arrived. The aida cloth was huge. Bigger than anything I’d ever tried to stitch before, bigger than my goddaughter. But it was too late, as far as I know you can’t return craft supplies. 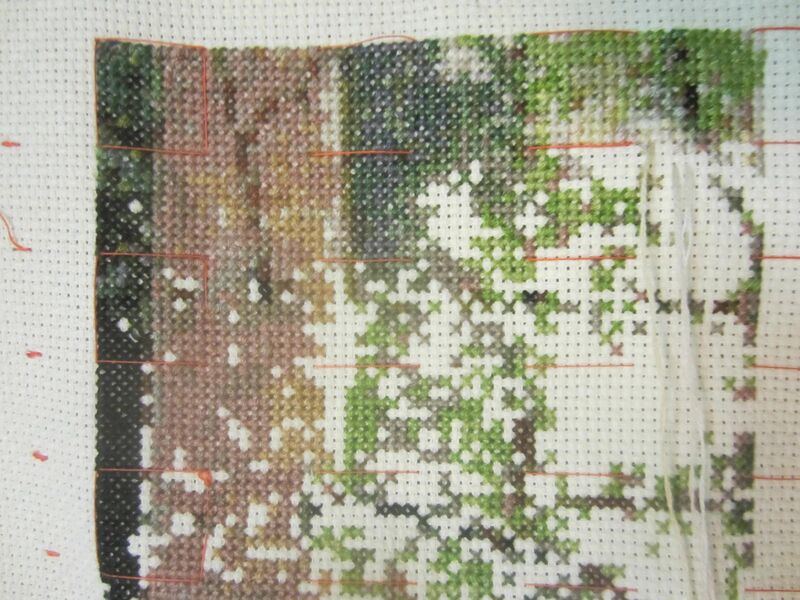 And I had already paid for an absurdly sized cross stitch .pdf. So, I started working on it… a little. At 30′ by 36′ this project doesn’t really fit into my travel bag. The dimensions of this piece are intimidating. So much so, that for a while there I wasn’t crafting. I justified it by being busy with work and self-publishing, but I know stitching is my one true love and I was pushing it aside. To be honest, I felt guilty working on anything else. Despite the fact that I have a lot of other projects to-do for the upcoming months, some that I am very excited about! Then, a few days ago Kate at PDX Stitch posted about a large X-Files project that she’s been working on, and I was motivated by her commitment to her work. The next day I sat down and I really started to stitch away at the canvas. I am going to make an effort to post about this project at least once a month, if only so that you’ll support me as I work through 162,500 stitches in 54 colours. Luckily the person who commissioned it loves me, so they’re okay with the wait. 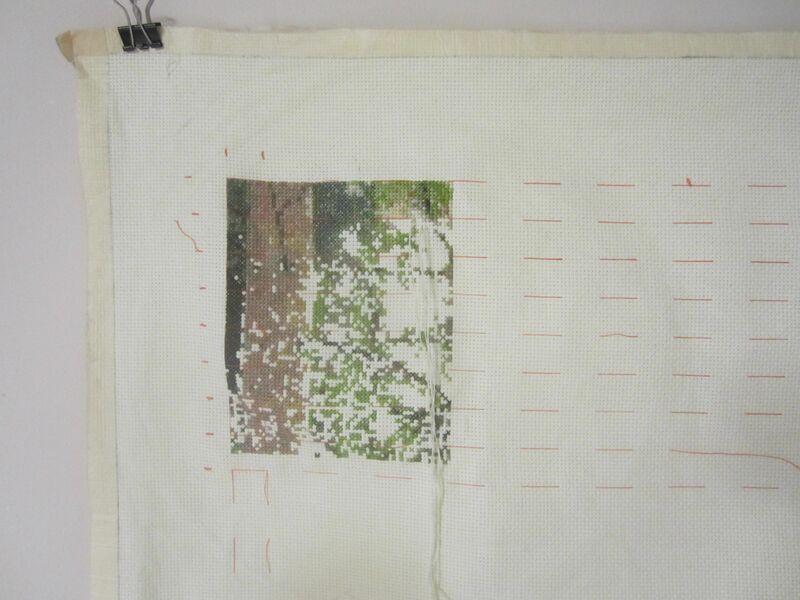 What’s the largest project you’ve ever stitched? Do you have any techniques for keepin’ at it? Or any words of encouragement?